31 days to spring…just gimme some color! Yep, that’s me. I proclaim myself a victim of SAD (Seasonal Affective Disorder). According to Wikipedia: SAD, also known as winter depression or winter blues, is a mood disorder in which people who have normal mental health throughout most of the year experience depressive symptoms in the winter. As I look out my studio window this afternoon, I see more snow coming down. Projection: 4 inches of the inconvenient stuff. White stuff on top of older white stuff. It was pretty the first time it snowed this winter (Dec. 19), but after the first 4 inches, enough was enough. It was 26.4 inches total for that first snowfall alone. I think it has snowed at least six times since then, including the 30″ we got over February 5. Fortunately, we were in sunny Florida during that blizzard, but we came home to the aftermath, followed by the additional 10.5 inches we got two days later on February 10. Ah yes, it was pretty the first time. Now it is just a pain. If I wanted this kind of snowfall, I would have already moved to any one of those snowy states starting with the letter “M”—Maine, Montana, Minnesota or Michigan. On Thursday morning Michael’s father took us to the Marie Selby Botanical Gardens in Sarasota. The 9.5-acre bayfront property is best known for its living collection of more than 6,000 orchids as well as its large representation of warm tropical epiphytes. Epiphytes are plants that grow upon another plant (such as a tree) non-parasitically or on objects such as buildings or wires. They derive moisture and nutrients from the air and rain and are found in temperate zones. Epiphytes include some ferns, cacti, orchids, bromeliads, mosses, liverwort, Spanish moss, lichens and algae. 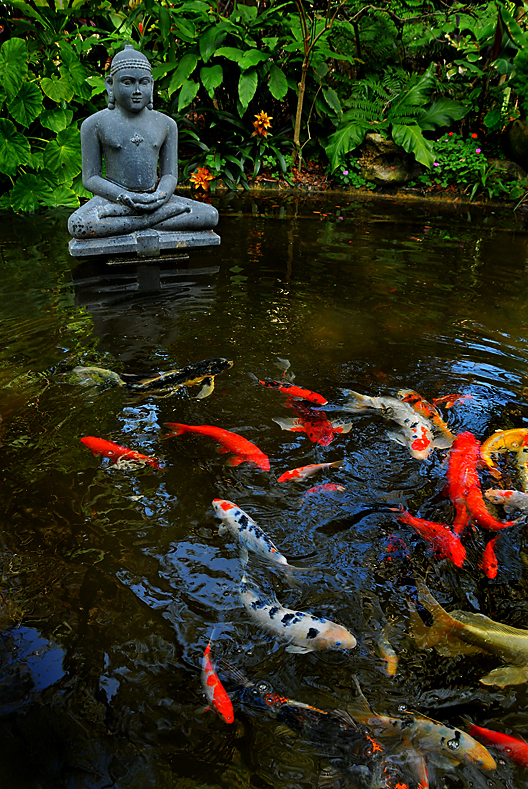 Wikipedia: Koi were developed from common carp in Japan in the 1820s and are a symbol of love and friendship. The carp is a large group of fish originally found in Central Europe and Asia….The ability of carp to survive and adapt to many climates and water conditions allowed the domesticated species to be propagated to many new locations including Japan. Carp as known as koi in Japan. I especially enjoyed the art exhibit, Batiks Botanicos—Gardens, Plants and Flowers for the Soul, on display until February 23 at the Museum of Botany and the Arts in the Mansion at Selby Gardens. A native of Colombia, artist Angela Maria Isaza captures tropical and exotic plants using the batik process. Originating in the East, batik is a wax-resist dyeing technique. Isaza applies hot wax and various dyes to natural fiber cloth to create her beautiful paintings. This step-by-step process is based on the principle that wax resists the water-based dyes. After wax is applied to certain areas, the fabric is dyed in one color. The dye penetrates the unwaxed areas. This process is repeated several times. The wax is removed by ironing the cloth between newspaper pages. Many of the paintings that are on display can be seen on her website here. See more photos and posts on our brief trip in Sarasota on my main blog here. WE NEED YOUR VOTES FROM FEBRUARY 1-15! Many of my regular visitors know that I do volunteer design and photography work for Mary Ellen Ryall, founder of Happy Tonics, Inc., a nonprofit 501(c)(3) environmental education in Shell Lake, Wisconsin. The purpose of the organization is to promote organic gardening and open pollination for biodiversity. Happy Tonics is dedicated to teaching about the risks of invasive species and genetic engineering to the food supply, and their impact on the environment, other species, indigenous and native crops, and health. Happy Tonics created a restored remnant tall grass prairie two years ago (the Monarch Butterfly Habitat). Happy Tonics has applied for a $999 grant proposal with Brighter Planet and is in fourth place now. Voting takes place from Feb. 1-15. Please take a minute to visit the Happy Tonics blog here. You’ll find a link to the sign-up and voting page for Brighter Planet in the first posting. You can also skip the blog and register to vote here. You can vote multiple times, too! On this second link, you’ll meet Mary Ellen, founder of Happy Tonics. It doesn’t cost a thing and will only take a moment of your time!